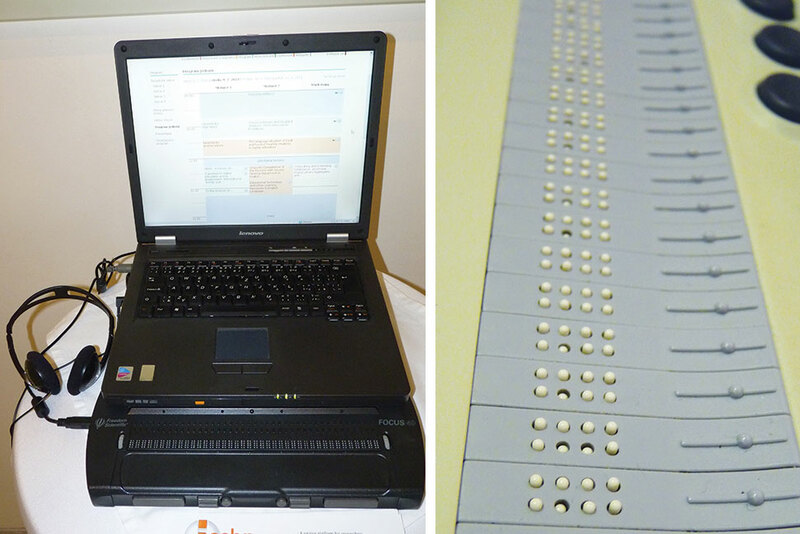 Two different types of refreshable Braille display laptop readers demonstrated at the 2011 Universal Learning Design Conference, Brno, Czech Republic. On June 28, 2013, delegates from member countries of the World Intellectual Property Organization (WIPO), a United Nations agency, signed the “Marrakesh Treaty to Facilitate Access to Published Works for Persons Who Are Blind, Visually Impaired, or Otherwise Print Disabled” (AL, Sept./Oct. 2013, p. 14). This historic treaty, intended to ease international copyright restrictions on publications for print-disabled readers, still requires ratification by at least 20 WIPO member countries in order to become legally binding. At the 37th UNESCO General Conference in Paris in November 2013, a parallel resolution passed overwhelmingly. 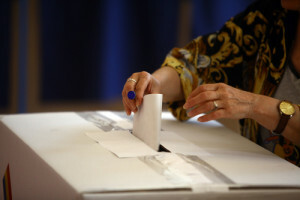 Endorsed by the Governing Board of the International Federation of Library Associations and Institutions (IFLA) and developed by its Libraries Serving Persons with Print Disabilities (LPD) section, the “Manifesto for Libraries Serving Persons with a Print Disability” (the LPD Manifesto) is an expression of the political will to include everyone in the information stream. It urges libraries worldwide to “improve and promote accessible library and information services” to the estimated 285 million blind and visually impaired people on the planet. Nearly 21 million reside in the United States, not including millions more with print disabilities due to physical or organic reading impairment such as dyslexia. 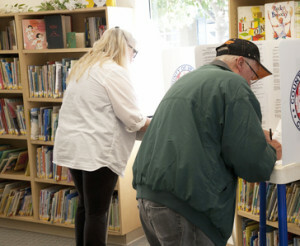 The LPD Manifesto points to the necessary services, collections, equipment, and facilities that libraries must provide to ultimately level the playing field and help eradicate the current “book famine,” a term coined by the World Blind Union to draw attention to the fact that less than 5% of books published annually are accessible to print-disabled individuals. The history of the manifesto dates back to the IFLA LPD “People, Public Libraries, Publishers” conference (P3 conference) in Mechelen, Belgium, in August 2009. The LPD section began drafting a statement to raise political awareness and support the negotiation process at WIPO for what later became the Marrakesh Treaty. The LPD Manifesto went through many drafts and was finally endorsed by the IFLA governing board in April 2012, too late for adoption at the UNESCO 36th Biennial General Conference held in November 2011. With the help of IFLA policy staff, LPD applied for UNESCO recognition in November 2013 and was successful in gaining adoption of the Manifesto at the Paris conference. As WIPO stakeholders continue to develop the infrastructure and mechanics for sharing digital files of accessible-format works through the Accessible Books Consortium (launched in June 2014 to implement the objectives of the Marrakesh Treaty), decision makers and library leaders who support equitable library services are encouraged to create action plans that follow the legislative, economic, and universal design guidelines described in the Manifesto. With the advent of digital information, accessible platforms, technology, and hardware, the opportunity for equitable access for people with print disabilities is now within reach. The full text of the LPD Manifesto, endorsed by IFLA in April 2012, follows. The United Nations Convention on the Rights of Persons with Disabilities (especially articles 9, 21, and 24) states that print-disabled people have the right to equal access to books, knowledge, and information at the same time, cost, and quality as everyone else. There are over 285 million blind and partially sighted people in the world, and this number is growing. There are even more people with other print disabilities who cannot effectively read print because of a physical, perceptual, developmental, cognitive, or learning disability. Together this makes up a very large number of people who cannot read a conventional book, magazine, or website. Less than 5% of all published materials and reportedly less than 20% of websites are accessible to this target group. Libraries are a community’s “portal” to information, knowledge, and leisure, and their services need to be made accessible for all. Content and technology providers are essential partners in developing these inclusive information and leisure reading services. They should do so by making good use of the emerging possibilities of digitized publishing and delivery. IFLA recommends that all library and information providers, as part of their core services, put in place services, collections, equipment, and facilities, which will assist individual users with a print disability to access and use resources that meet their particular needs for information. IFLA encourages library and information service providers to consult individuals with a disability, and groups representing them, in the planning, development, and ongoing delivery of services. IFLA acknowledges that the best services are provided by professionals who are aware of the needs of, and service options for, people with a print disability. Therefore, IFLA encourages all library and information services to ensure that staff are adequately trained and available to work with users with a print disability, and supports career-long professional development and formal library and information studies programs, which will facilitate the strengthening of equitable library and information services to people with a print disability. IFLA supports efforts to improve access to resources by people with a print disability through service agreements, referrals, and sharing of resources between library and information services; and between these and other organizations specializing in services targeted for people with a print disability. Therefore, IFLA encourages the establishment and development of an international network of libraries of accessible materials. IFLA supports efforts to ensure that copyright legislation enables equal access by people with a print disability to information from all libraries and information providers. In addition to meeting legislative requirements, IFLA encourages the observation of universal design principles, guidelines, and standards to ensure that library and information services, collections, technologies, equipment, and facilities meet the identified needs of users with a print disability. all funding bodies to adequately resource library and information services for persons with a print disability. MIKE L. MARLIN is director of the Braille and Talking Book Library at the California State Library in Sacramento. He is an ALA Councilor-at-Large and the representative to the IFLA Libraries Serving Persons with Print Disabilities Section for ALA and its Association of Specialized and Cooperative Library Agencies division. Email mike.marlin@library.ca.gov.